The U.S. Department of Energy’s Oak Ridge National Laboratory (ORNL), home to the world’s fastest supercomputer, just installed two NVIDIA DGX-2 systems for use in machine learning tasks. “[The] powerful GPU-accelerated appliances will provide ORNL researchers with enhanced opportunities to conduct science—machine learning and data-intensive workloads,” the ORNL team wrote in a blog post. Last year, the laboratory installed Summit, the world’s fastest supercomputer, which is equipped with 27,648 NVIDIA Tensor Core V100 GPUs. The new machines will help ORNL researchers test their projects before running them on the 200 petaflop Summit supercomputer. The NVIDIA DGX-2 is equipped with 16 interconnected NVIDIA Tensor Core V100 GPUs. In today’s blog post, the ORNL team describes how a staff scientist at the organization trained and optimized reinforcement learning algorithms on the new machines for cancer research. 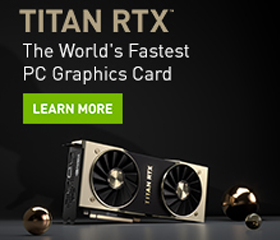 By running the algorithms on the NVIDIA DGX-2 systems, the team was able to develop software at a fraction of the time it would have taken on another system.